Paul Andrew is technical product manager for Identity Management on the Office 365 team. Scenario 4. You have multiple forests in your on-premises Active Directory under Technical requirements has been updated. We get a lot of questions about which of the three identity models to choose with Office 365. Which of these models you choose will impact where you manage your user accounts for Office 365 and how those user sign-in passwords are verified. In this post I’ll describe each of the models, explain how to move between them, and provide guidance on how to choose the right one for your needs. In the diagram above the three identity models are shown in order of increasing amount of effort to implement from left to right. Our recommendation for successful Office 365 onboarding is to start with the simplest identity model that meets your needs so that you can start using Office 365 right away. Then, as you determine additional necessary business requirements, you can move to a more capable identity model over time. The way to think about these is that the Cloud Identity model is the simplest to implement, the Federated Identity model is the most capable, and the Synchronized Identity model is the one we expect most customers to end up with. Let’s look at each one in a little more detail. Cloud Identity. In this model a user is created and managed in Office 365 and stored in Azure Active Directory, and the password is verified by Azure Active Directory. Azure Active Directory is the cloud directory that is used by Office 365. There is no equivalent user account on-premises, and there is nothing that needs to be configured to use this other than to create users in the Office 365 admin center. Synchronized Identity. In this model the user identity is managed in an on-premises server and the accounts and password hashes are synchronized to the cloud. The user enters the same password on-premises as they do in the cloud, and at sign-in the password is verified by Azure Active Directory. This model uses the Microsoft Azure Active Directory Sync Tool (DirSync). Federated Identity. This model requires a synchronized identity but with one change to that model: the user password is verified by the on-premises identity provider. This means that the password hash does not need to be synchronized to Azure Active Directory. This model uses Active Directory Federation Services (AD FS) or a third- party identity provider. We recommend that you use the simplest identity model that meets your needs. If your needs change, you can switch between these models easily. Here’s a description of the transitions that you can make between the models. The second way occurs when the users in the cloud do not have the ImmutableId attribute set. In this case we attempt a “soft match,” which looks at the email attributes of the user to find ones that are the same. If we find multiple users that match by email address, then you will get a sync error. If you want to be sure that users will match using soft-match capabilities, make sure their PrimarySMTP addresses are the same both in Office 365 and in the on-premises Active Directory. If all of your users are entered in the cloud but not in your Active Directory, you can use PowerShell to extract them and then you can import them into Active Directory so that soft match will work. Synchronized Identity to Federated Identity. This transition is required if you deploy a federated identity provider, because synchronized identity is a prerequisite for federated identity. The user identities are the same in both synchronized identity and federated identity. Because of this, changing from the Synchronized Identity model to the Federated Identity model requires only the implementation of the federation services on-premises and enabling of federation in the Office 365 admin center. Switching from Synchronized Identity to Federated Identity is done on a per-domain basis. The operation both defines the identity provider that will be in charge of the user credential validation (often a password) and builds the federation trust between Azure Active Directory and the on-premises identity provider. When you switch to federated identity you may also disable password hash sync, although if you keep this enabled, it can provide a useful backup, as described in the next paragraph. Federated Identity to Synchronized Identity. You can convert a domain from the Federated Identity model to the Synchronized Identity model with the PowerShell command Convert-MsolDomainToStandard. Since the password sync option in DirSync is a recent addition, some customers will make this transition to take advantage of that and simplify their infrastructure. This transition can also be a useful backup in case there is a failure with the federated identity provider, because any failure with the federated identity provider—including the physical server, the power supply, or your Internet connectivity—will block users from being able to sign in. The switch back from federated identity to synchronized identity takes two hours plus an additional hour for each 2,000 users in the domain. Once you have switched back to synchronized identity, the user’s cloud password will be used. We recently announced that password hash sync could run for a domain even if that domain is configured for federated sign-in. Previously Azure Active Directory would ignore any password hashes synchronized for a federated domain. This recent change means that password hash sync can continue for federated domains, so that if you switch from Federated Identity to Synchronized Identity the password validation will be available immediately. If you do not have password sync configured as a backup and you switch from Federated Identity to Synchronized Identity, then you need to configure that, assign passwords with the set-MsolUserPassword PowerShell command, or accept random passwords. Synchronized Identity to Cloud Identity. You can turn off directory synchronization entirely and move to cloud-managed identities from within the Office 365 admin center or with the PowerShell command Set-MsolDirSyncEnabled. This update to your Office 365 tenant may take 72 hours, and you can check on progress using the Get-MsolCompanyInformation PowerShell command and by looking at the DirectorySynchronizationEnabled attribute value. There is a KB article about this. Scenario 1. You already have an AD FS deployment. If you already have AD FS deployed for some other reason, then it’s likely that you will want to use it for Office 365 as well. This also likely means that you now have multiple SaaS applications that are using AD FS federated sign-in and Azure Active Directory is connecting to the existing infrastructure that you maintain for AD FS with little additional overhead. Of course, having an AD FS deployment does not mandate that you use it for Office 365. You can still use password hash sync for Office 365 and your AD FS deployment for other workloads. Scenario 2. You already use a third-party federated identity provider. If your company uses a third- party, non-Microsoft, identity provider for authentication, then federated identity is the right way to do that. Third-party identity providers do not support password hash synchronization. Microsoft has a program for testing and qualifying third-party identity providers called Works with Office 365 – Identity. Scenario 3. You use Forefront Identity Manager 2010 R2. Forefront Identity Manager 2010 R2 can be used to customize the identity provisioning to Azure Active Directory with the Forefront Identity Manager Connector for Microsoft Azure Active Directory. It offers a number of customization options, but it does not support password hash synchronization. Scenario 4. You have multiple forests in your on-premises Active Directory. The DirSync tool does not support multiple forests. Because of this, if you are synchronizing multiple forests you need to either use Forefront Identity Manager 2010 R2 with the Forefront Identity Manager Connector for Microsoft Azure Active Directory or the new Azure Active Directory Sync Services. None of these alternate synchronization tools currently support password hash sync; hence users would not automatically have the same password on-premises and online without federated identity. Before proceeding with such a deployment, you may also consider consolidating your forests so that you can use the DirSync tool, which supports only one forest. Forest consolidation is described in this TechNet article. Azure AD Sync Services can support all of the multi-forest synchronization scenarios, which previously required Forefront Identity Manager 2010 R2. This means that AD FS is no longer required if you have multiple on-premises forests and this requirement can be removed. 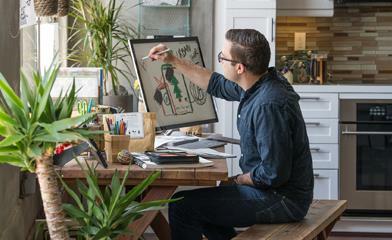 Read more about Azure AD Sync Services here. Scenario 5. You have an on-premises integrated smart card or multi-factor authentication (MFA) solution. Azure Active Directory does not have an extensible method for adding smart card or other authentication providers other than by sign-in federation. Often these authentication providers are extensions to AD FS, where Office 365 sign-in can take advantage of them through federation with the AD FS provider. Azure Active Directory does natively support multi-factor authentication for use with Office 365, so you may be able to use this instead. Scenario 6. Custom hybrid applications or hybrid search is required. Custom hybrid application development, such as hybrid search on SharePoint or Exchange or a custom application on SharePoint, often requires a single authentication token to be used both in the cloud and on-premises. This is more than a common password; it is a single sign-on token that can be passed between applications for user authentication. This is only for hybrid configurations where you are undertaking custom development work and require both the on-premises services and the cloud services to be authenticated at the same time. Scenario 7. Web-accessible forgotten password reset. For a federated user you can control the sign-in page that is shown by AD FS. It is possible to modify the sign-in page to add forgotten password reset and password change capabilities. This feature is not provided with AD FS but can be manually added during deployment of your AD FS implementation, as described on TechNet. You cannot edit the sign-in page for the password synchronized model scenario. Alternatively, Azure Active Directory Premium is an additional subscription that can be added to an Office 365 tenant and includes forgotten password reset for users in any of the three Identity models. Scenario 8. You require sign-in audit and/or immediate disable. With federated identity using AD FS, each sign-in attempt is logged in the standard Windows event log in the same way that on-premises sign-in attempts are logged. You can also disable an account quickly, because disabling the account in Active Directory will mean all future federated sign-in attempts that use the same Active Directory will fail (subject to internal Active Directory replication policies across multiple domain controller servers and cached client sign-in tokens). Sign-in auditing and immediate account disable are not available for password synchronized users, because this kind of reporting is not available in the cloud and password synchronized users are disabled only when the account synchronization occurs each three hours. An alternative for immediate disable is to have a process for disabling accounts that includes resetting the account password prior to disabling it. The password change will be synchronized within two minutes to Azure Active Directory and the user’s previous password will no longer work. Alternatively, you can manually trigger a directory synchronization to send out the account disable. Scenario 9. Single sign-on is required. Password synchronization provides same password sign-on when the same password is used on-premises and in Office 365. With single sign-on, you can sign in to your Windows PC that is connected to your Active Directory domain and you do not need to re-enter your password when you connect to Office 365. This requires federated identity and works because your PC can confirm to the AD FS server that you are already signed in. An alternative to single sign-in is to use the Save My Password checkbox. This stores the user’s password in Windows Credential Manager (CredMan), where it is secured by the login credentials for the PC, and the user can sign in to their PC to unlock the passwords that CredMan uses. Note that the Outlook client does not support single sign-on and a user is always required to enter their password or check Save My Password. Scenario 10. Require client sign-in restrictions by network location or work hours. There are two features in Active Directory that support this. Client Access Policy is a part of AD FS that enables limiting user sign-in access based on whether the user is inside or outside of your company network, or whether they are in a designated Active Directory group and outside of your company network. For users who are to be restricted you can restrict all access, or you can allow only ActiveSync connections or only web browser connections. In addition, Active Directory user policies can set login restrictions and are available to limit user sign-in by work hours. Federation delegates the password validation to the on-premises Active Directory and this means that any policies set there will have effect. Scenario 11. Policy preventing synchronizing password hashes to Azure Active Directory. A small number of customers will have a security policy that precludes synchronizing password hashes to Azure Active Directory. In that case, you would be able to have the same password on-premises and online only by using federated identity. Microsoft is strongly committed to the security of all customer data. We encourage security professionals to review our Office 365 Trust Center. Also, we have details about how password hashes are synchronized in the TechNet article Implement Password Synchronization, and we have additional security guidance about password hash synchronization published on TechNet. To sum up, you should consider choosing the Federated Identity model if you require one of the 11 scenarios above. Recent enhancements have improved Office 365 sign-in and made the choice about which identity model you choose simpler. The guidance above for choosing an identity model that fits your needs includes consideration of all of these improvements, but bear in mind that not everyone you talk to will have read about them yet. 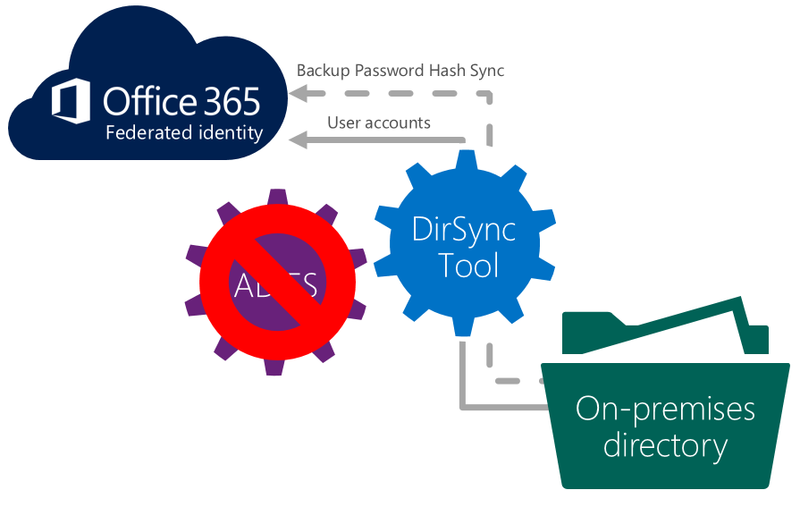 In June 2013 password hash sync was added to the DirSync tool so that the same password would be available on-premises and online. In October 2013 we released Windows Server 2012 R2 including AD FS. In November 2013 we added support for the DirSync tool to run on one of your existing Domain Controllers. This can simplify the deployment for some users with small directories. In February 2014 we introduced multi-factor authentication for Office 365, which is available for password hash sync users. Prior to this you would require federated sign-in to support any multi-factor authentication. In April 2014 Azure Active Directory Sync Services was released in preview to support multi-forest sync. In April 2014 Azure Active Directory Premium including Password Reset was released. In April 2014 use of alternate sign-in ID reducing dependency on UPN was added. In May 2014 password hash sync added the capability to act as a sign-in backup for federated sign-in. By the end of 2014 Office client applications are planned to support passive authentication models. The three identity models you can use with Office 365 range from the very simple with no installation required to the very capable with support for many usage scenarios. By starting with the simplest identity model that meets your needs, you can quickly and easily get your users onboarded with Office 365. Later you can switch identity models, if your needs change.